The rest is history and Botox is now used cosmetically to treat a wide variety of conditions. After a consultation with one of Skin Deep Medical’s healthcare professionals to assess the areas of the face that need treating, a few extremely small amounts of muscle relaxant such as Botox, Azzalure or Bocouture are injected in to the specific muscles causing the lines and wrinkles. For your convenience and as a point of reference, you can find further information concerning the most commonly used muscle relaxants in use today on our products page. The treatment works by blocking the electrical signals from the brain to the muscles which then gradually relax . As the muscles relax, the lines and wrinkles are smoothed away often completely disappearing. 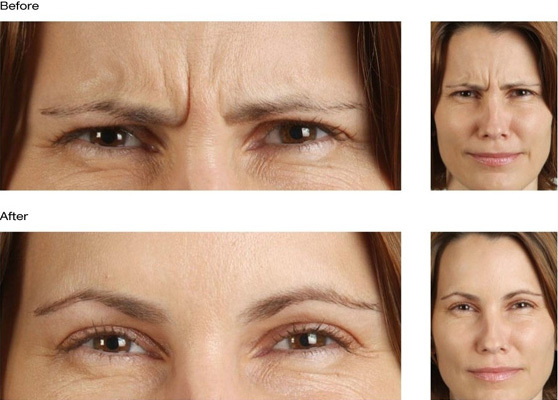 Botox only relaxes the targeted muscles which means that natural facial expression is maintained. The face is revitalized and looks younger and fresher . Treatment is safe, quick, straightforward, painless and the results are fantastic. Botox treatment is often supplemented by other anti-ageing treatments such as dermal fillers e.g. Restylane, Juvederm Ultra, Belotero, etc.